Home » The Tony Robbins Blog » Mind & Meaning » What’s your morning ritual? 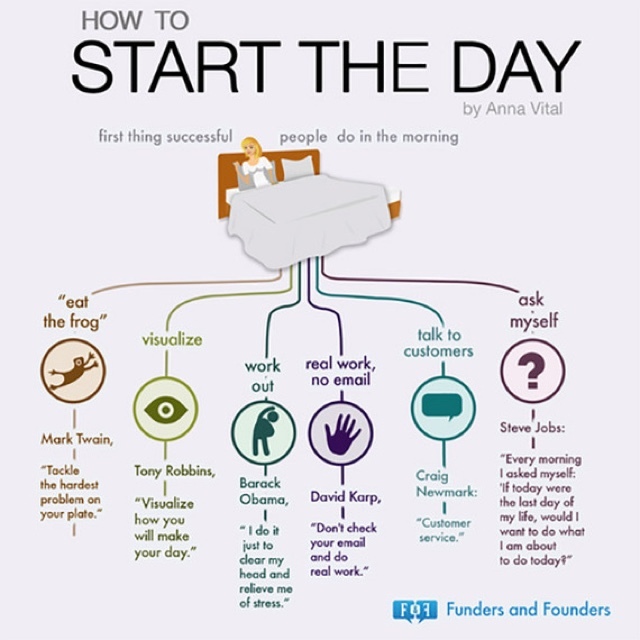 How important is a morning ritual? While most people dread having to face the start of what may be a stressful day, an uplifting and positive incantation can be enough to completely alter how you feel. How do you view each morning? If the thought of getting out of bed and preparing for each day fills you with dread, this mood is likely to carry throughout the rest of your day, leaving you in a perpetual state of immobility. By planning an effective morning ritual, you can set the day in motion with a much better approach. The Huffington Post published an article on morning rituals that help you create a better day, and ultimately a better life. The author places particular emphasis on the benefits of visualization, and how Tony Robbins takes it to the next level by adding positive incantations. That’s right, not affirmations – incantations. By setting aside time for tried-and-true incantations, each successful morning can become a successful day and eventually a better life. When preparing a morning ritual, it is important to recognize the difference between an affirmation and an incantation. Affirmations are spoken words of encouragement, but while the positive thinking is there, affirmations may fail you as a transformative technique. If you want to create real change in your life, affirmations alone aren’t enough. You can recite something uplifting, but if you aren’t embodying it physically, you are only skimming the surface. Incantations, however, are about embodying the meaning behind the words, which is why they are so powerful. With incantations, not only are you speaking words of empowerment, you are using your body and your voice. With incantations, you are changing your physiology and changing your state, leading to a different and more positive outlook and approach to each day. While affirmations sound positive, they may not carry the full weight of emotion and transformative power if the person saying them aloud does not actually believe in the thoughts and meaning behind them. Incantations are meant to reverberate throughout the body and mind and alter one’s sense of self. The tools for success are available to those who know how to reach them. Incantations as part of your morning ritual can serve as a powerful reminder of this, giving you the confidence you need for taking the first important step at the beginning of each day. Incantations are all about committing your life to positive energy and accessing the confidence within yourself. Using incantations to help take direct control of your state can make all the difference in the quality of your life. Because the quality of your life is not necessarily based on the quality of your circumstances, you can effectively adjust the mental and emotional filters that determine how you look at your life. This influences the stories we tell ourselves about who we are, what we’re capable of or what’s achievable or not. The states we go into most often then become the most powerful filter of all that will determine whether we find the strategies necessary to succeed and whether we come up with a story that will empower us. It is important to manage your time, since planning an effective morning ritual means giving yourself enough time to reflect and visualize. Whether you are rushing to get to work or thinking of the next errand you need to run, rushing through your morning incantations can diminish theirpower. Plan for a comfortable amount of time, during which you will have a clear and stress-free mind and the ability to focus on these important positive incantations. Changing your life can be difficult, whether it is altering your morning ritual or making other important and positive changes to an established routine. This is where a life coach may be helpful. With the assistance of a life coach, your morning ritual can be efficiently mapped out with the insight of an experienced professional. Reorganizing your entire morning, giving yourself enough time and applying new techniques to the start of your day can be a daunting task. Assistance – and accountability – can be your keys to establishing healthy habits to bring about positive changes to your day, and your life. Morning rituals have the potential for making powerful transformations to your everyday existence. Change for a better outlook is always possible, but how does one achieve it? Our true potential can be met with positive incantations, which we can use to recognize the confident and driven person living within ourselves. One of the greatest scientific discoveries has been that you can alter your emotional mood by a radical shift in your physiology, and we can start to achieve that through incantations.